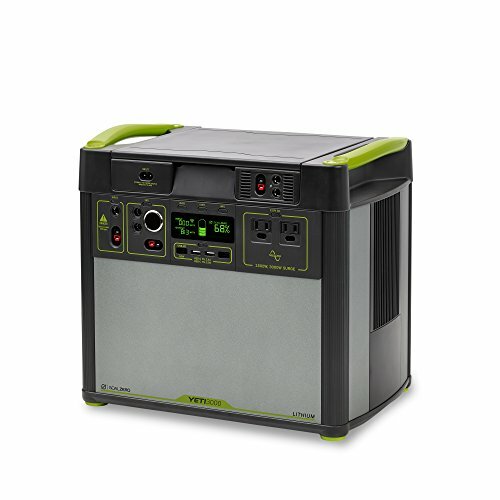 Need off the grid electrical power for emergencies, camping, or the job site? 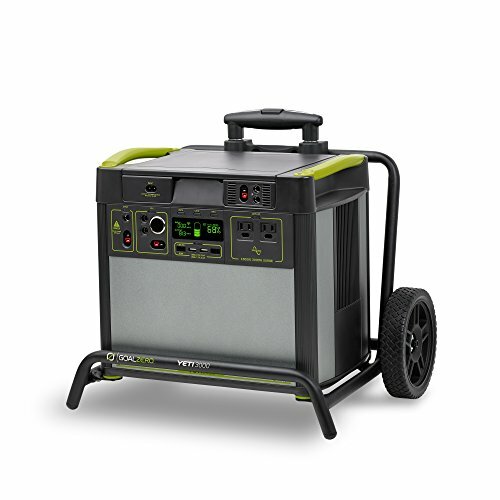 Before you look at gas-powered generators – you should check out the Goal Zero Yeti Lithium line of portable power solutions. 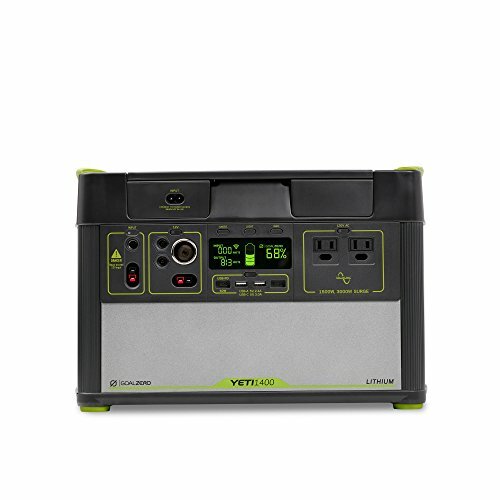 The Goal Zero Yeti Lithium line are generator alternatives – they are powerful batteries based on Lithium Ion (Li-ion) technology that have a variety of charging options. These can power the modern devices of 2019 – they include USB ports, 12V, and AC outlets for appliances. These units can handle them all. Best of all? The Lithium battery technology is lightweight and robust. That’s right – these can be charged up with solar power. Free electricity – but more importantly, it’s a source of power you can use in remote areas. Or, you can charge them from any AC outlet – of course. These are great as an emergency power option for your home – think black-outs, storms, and hurricanes. Have plenty of power for your backyard or park birthday parties – or for the ultimate tailgate. And lastly, these will work on remote job sites as well. The most powerful units have the capacity to handle power tools. All of these products use advanced Lithium-Ion batteries – just like your smartphone or laptop. These are the batteries of the future, and generally speaking they are superior to lead-acid batteries. Here’s a bit more about why Lithium-Ion batteries are superior to lead-acid batteries. Goal Zero also makes portable power stations using lead-acid battery technology – similar to the battery in your car. What’s the difference between that and Lithium? First and foremost, Lithium batteries are lighter and have a much longer shelf-life. Lead-acid batteries are significantly heavier – and have to stay on the charger at all times for best life. There are some downsides to Lithium technology though. Lithium is more sensitive to cold temperatures. Lithium is a newer technology – and it is more expensive as well. But, a Li-ion battery will last longer as compared to lead-acid – because the number of times you can re-charge the battery before it wears out is much greater. And, as anyone with a car knows – lead-acid batteries can experience “sudden death”. With Lithium, it’s a more gradual decrease in capacity that gives you plenty of time to prepare. Over a long time period, a Lithium-Ion battery will be a cheaper solution, with all other things being equal. Li-Ion is more expensive, but it lasts significantly longer and it’s much lighter. That’s what we want in a portable power solution. And therefore, that’s what we’ll highlight here. Let’s look at some products. 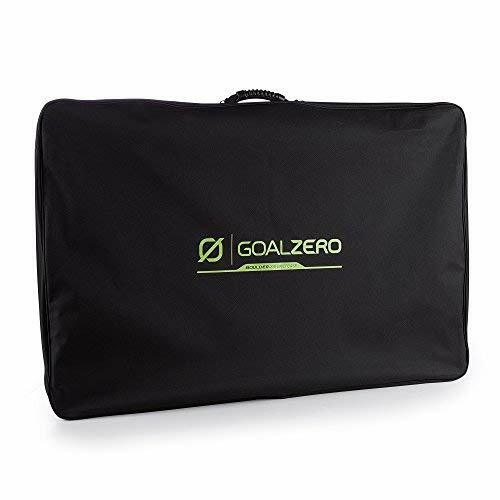 The Goal Zero Yeti 400 Lithium (Buy on Amazon) is the smallest Lithium (both in physical dimensions and electrical capacity) portable power solution offered by Goal Zero. Here’s some stats on this unit. Capacity 428Wh, 39.6Ah (10.8V) Battery capacity. Notice the number of charge cycles. This is how many re-charges the battery can take. As we explained earlier – these batteries will last longer than regular lead-acid batteries of a similar power capacity. It’s just the nature of the Lithium-Ion technology. This unit is great for your portable devices – phones, tablets, and laptop computers. It can also power light household accessories for a limited time – LCD TVs, Mini-fridges, and electric blanket heaters. Here it is, in action. Camping with a CPAP machine (or other medical device)? The Yeti 400 is the perfect solution. It’s silent, no fumes, and has plenty of power for about 2 nights usage of the CPAP machine. The 400 is the smallest Lithium based power solution from Goal Zero. If you need more electrical power, read on for another option. What Can You Do With Yeti Batteries and Solar Power? Of course you can use your Yeti power station for the obvious things – like charging up your phone, laptop computer, or camera. But, here’s some more interesting things you can do too. Keep the fridge running during a hurricane. Run a CPAP machine (such as the Phillips ResMed or similar) while camping. Or use any other medical device requiring electric power. Charge up drone batteries in the field. Run a fan or lights during a power outage. Live in a condo? You may not be allowed to run a gas-powered generator in emergencies or storms. Use it on a boat (small or large) for extra power. Charge up an electric bike, scooter, or electric skateboard while camping. Be the campsite hero with a coffee maker – or microwave. Both Lithium-Ion and Lead-Acid batteries can experience “thermal runaway” – and start a fire. Li-Ion batteries have a high energy density and as such are more prone to this issue. It’s the reason why these batteries aren’t transported in the aircraft cargo hold. 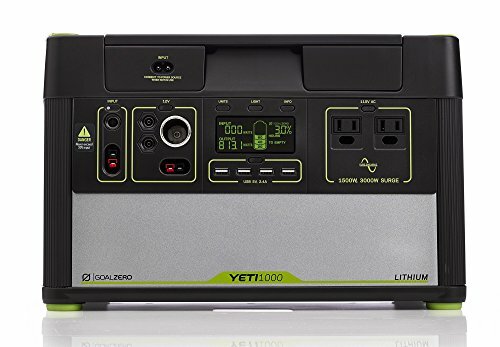 The Goal Zero Yeti 1000 Lithium (Buy on Amazon) provides increased electrical capacity at an affordable price. This is a big step up in electrical power – you can run power tools off of this device. The AC Inverter on this unit has a 3000W surge capability – and that’s important for tools that cause a large surge when starting. That makes it great for both longer-lasting power, but also for the job site. Capacity 1045Wh (10.8V, 96.8Ah) Battery capacity. Power Ports (Output) four USB ports, two AC outlets and 12V output. Let’s take a moment to review the capacity. The battery provides 1,045 watt-hours (Wh) of energy. That means we could power a 15-watt light bulb for almost 70 hours using this battery. Or, you could power two 15-watt light bulbs for 35 hours. And that’s the basics of how you figure out what you could do with this battery. To figure out how long you could power a device or appliance you need to know the amount of watts it consumes. There’s also a concept of surge – certain devices will consume a high amount of energy upon start-up, but then the usage level drops to normal levels. You’ll need to factor in the surge wattage as well, because if the inverter doesn’t have enough surge capacity – the appliance isn’t going to start. For example, a refrigerator compressor motor is such a device – it will cause a huge starting surge current – and if the battery can’t supply that – it’s going to fail to start. Let’s take a look at this battery further. Here’s a video. Why is it our favorite? It’s FREE electricity! Is solar a viable option for charging batteries? Yes – It is. The technology has come a long way since it was invented in the 1950s. It’s now highly affordable and effective. Let’s take a look at how you can benefit from the advances in technology. 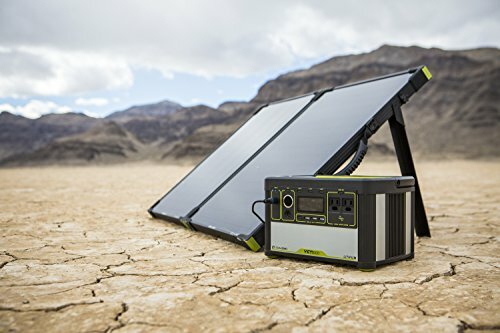 Solar Power for Camping – and just about anything else! The real killer feature of the Goal Zero Yeti platform? These power stations can be re-charged using solar panels. This is a clean, green solution that works anytime you have sunlight. Or not – solar actually works in overcast conditions also – just not as well. 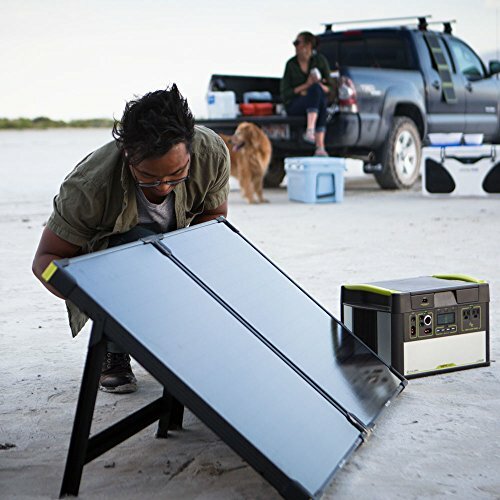 The solar panel option is ideal for camping, emergency, or other off-grid situations. It’s silent and produces no fumes – unlike a gas powered generator. 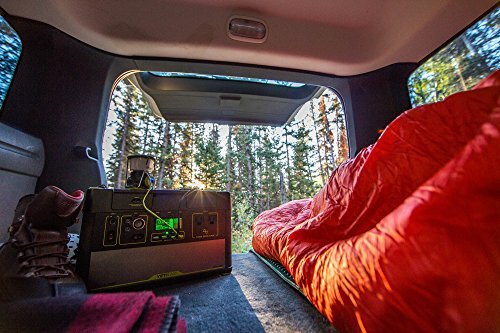 Your campsite neighbors will appreciate all those things. Do these require direct sunlight? They do for fastest charging, but in fact they utilize both the infrared (IR) and Ultraviolet (UV) radiation from the sun in addition to the visible light. This means you can even re-charge on a cloudy, overcast day. But – of course it will be slower. These panels are purpose-built for re-charging the Yeti portable power units. This unit provides 200W of charging power. It also has an integrated kickstand to help get the optimal angle to the sun, which is an important part of getting the fastest re-charge. 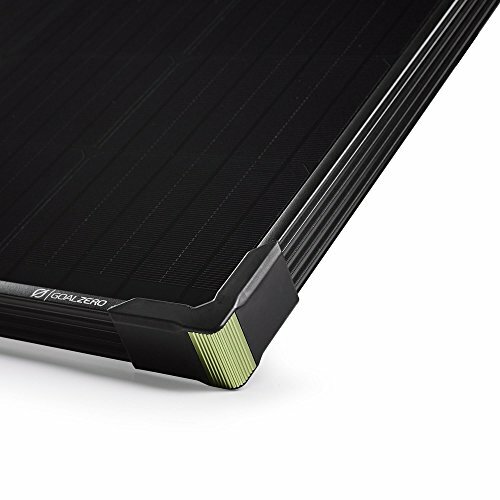 Why are they called “Briefcase” solar panels? Because they fold up into a compact form factor complete with carrying handle for easy transport. There’s lot’s of reasons that a battery is a better solution than a gas generator. For one, there are no fumes – you can safely use it indoors or outdoors. It’s also a silent option. Small gas-powered generators are notoriously noisy. The big benefit of a gas-powered generator is that you can fill it-up and it’ll work as long as you have enough gasoline. Some people use the Yeti power stations as a short term solution – keep things up and running, and break out the gas powered generator only if needed. This unit provides 100W of charging power. 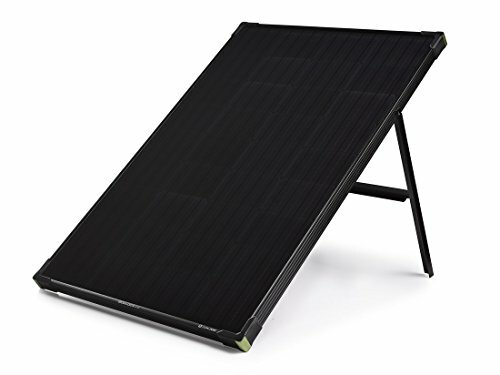 All solar panels work most efficiently when angled directly with the sun – so for best charging efficiency be sure to periodically reposition the panel as the sun moves. 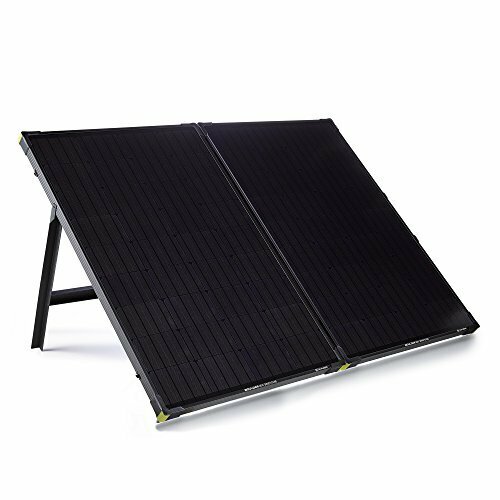 The Boulder 100 Solar Panel is built with strong tempered glass and an aluminum frame with added corner protection for temporary or permanent installation. Goal Zero’s next Lithium unit is the 1400. As the name suggests, it has approx. 1,400 Wh of capacity – or about 40% more than the Yeti 1000 model. And, it’s only 3 lbs heavier. That’s the beauty of the high energy density of the Lithium-Ion battery tech – you get lots of power for a minimum of weight. How much lighter is Lithium than Lead-Acid? A Yeti 1250 Lead-Acid unit provides 1,250 Wh at 103 lbs. The Yeti 1400 provides 1,425 Wh at only 43 lbs. That’s a HUGE difference. The Lithium solution is so much more practical – and it will last significantly longer – and you can discharge it deeper without fear of damaging the battery. 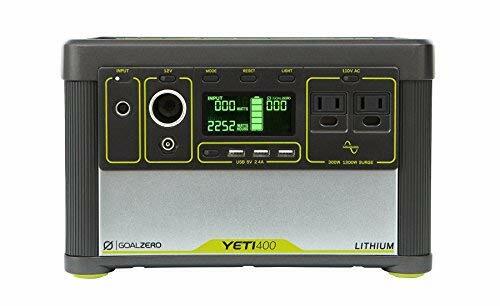 The Goal Zero Yeti 1400 Lithium (Buy on Amazon) provides lots of electrical power. Using App, check battery level, power in and out, even turn ports on and off, all from the palm of your hand. This unit is light-weight for what it is – but 43 lbs is still more than most people would like to comfortably carry. We recommend the Goal Zero roll cart for transporting this unit. It’s made specifically for the Goal Zero Yeti portable power stations. Lithium-Ion batteries are great as deep cycle batteries. What’s that? It’s a battery that can be discharged to a very low power state – and recover. The average lead-acid battery (such as that in your car) is very different – it works best when you constantly keep it charged up and don’t let it discharge too far. That negatively impacts the ultimate life span of the battery – the low charge levels will degrade the plates used within the battery – causing physical damage. There are lead-acid batteries specifically built to be deep-cycle batteries. They are more expensive because they are made with thicker plates and different chemistry to provide this ability. They are also more expensive. And – they are very heavy, just like all lead-acid batteries. Need lots of power? Then this is your model. Power a full size fridge for 50 hours! The Goal Zero Yeti 3000 Lithium (Buy on Amazon) is the king of the hill for portable, lithium based power. 3,075 Wh of electrical capacity in a mere 68 lbs. 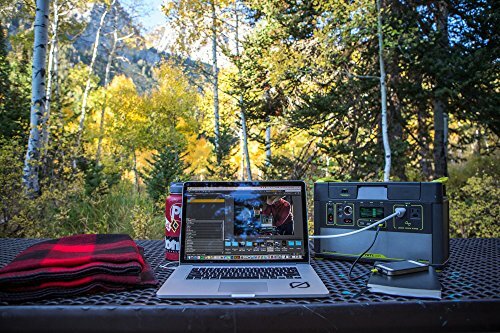 The Goal Zero Yeti 3000 Portable Power Station stores 3,075 watt-hours in a replaceable lithium battery pack with a variety of high-power outputs capable of running 10 devices at once. Features our exclusive patent-pending Pure-Sine Wave AC Inverter rated for 1500 watts continuous power and a 3000 watt surge. Run fridges, blenders, swamp coolers, tools, sump pumps, and more all at the push of a button. It operates with no noise, no fumes, no gasoline - making it perfectly safe to use both indoors and out. Recharge the internal battery by plugging it in at home, or pairing it with solar panels, sold separately. Check power usage and control the Yeti Power Station from any mobile device via the free Goal Zero Yeti App. It's easy to check battery levels, turn ports on and off, and even update firmware from almost anywhere. 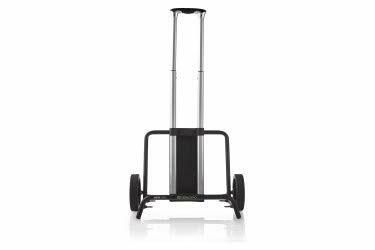 This unit is heavy at 68 lbs – but it comes with the Yeti roll cart – so no separate roll cart purchase is needed. And, because it’s such high capacity it has special charging logic unit called MPPT built right in – this ensures efficient charging via solar panels. 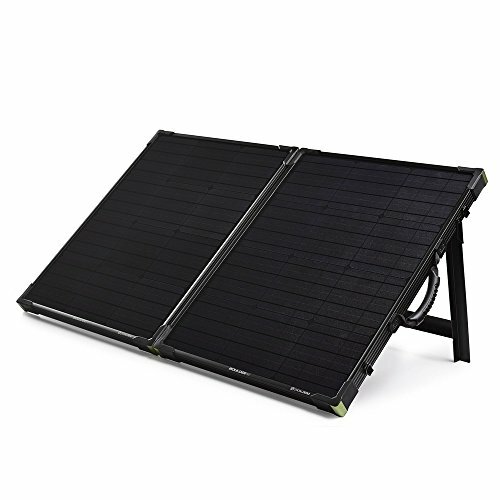 Given the capacity of this unit, we’d recommend using two sets of the Boulder 200 solar panels to charge. That’s right – you can use two sets of solar panels with this model. Indeed, the Yeti 3000 is the king of the hill. And when all is said and done – it’s still almost 30 lbs lighter than a smaller lead-acid battery with less than half the capacity! All these products have an inverter. What’s that? It’s the device that converts the Direct Current (DC) power from the battery to the Alternating Current (AC) power used by most house-hold devices. The Goal Zero Yeti 3000 inverter provides 1500W continuous power, with 3000W surge capability. Let’s recap one more time on Lithium vs Lead-Acid. 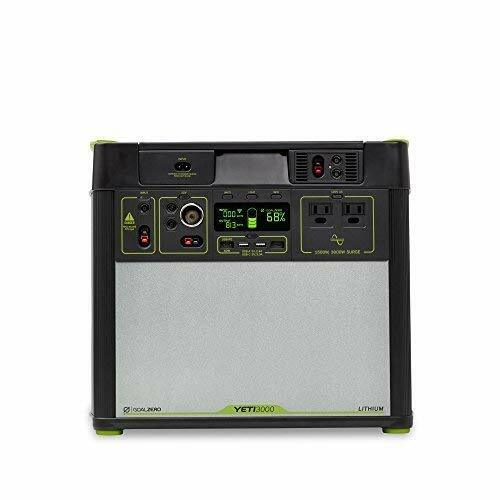 Yeti’s top of the line lead-acid portable power provides 1,250 Wh of electrical capacity and weights 103 lbs. 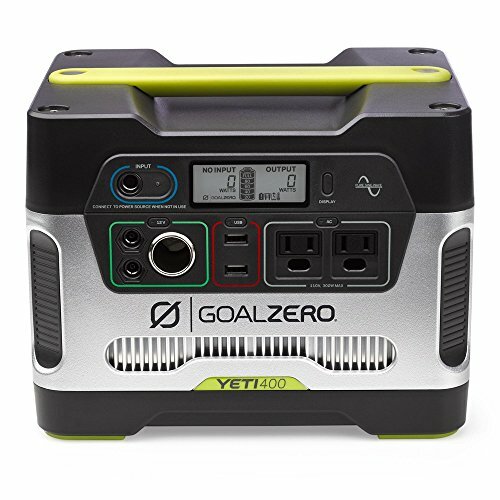 The Goal Zero Yeti 3000 (Lithium) provides 3,075 Wh at 68 lbs. Has more than twice the electrical capacity. Is significantly lighter – and easier to move – and much more practical to use. Can be discharged to a much lower level. Is a Yeti 1250 really a 1250 if they only recommend you discharge to no less than half capacity? Will last for significantly more charging cycles. The downside of Lithium – it is more expensive. But over a significant time period it will be cheaper. Over a ten year period, the Goal Zero Yeti 3000 (Lithium) will be the cheaper solution. Emergency power needs – like blackouts, hurricanes, and other storms. The Lithium-Ion (Li-ion) technology is light-weight and advanced. It also provides great electrical capacity, and has a good shelf-life. And that’s a great option for remote usage and outdoor recreation. You may also be interested in our review of Goal Zero Yeti power with lead-acid batteries. Lead-acid batteries are heavy, but robust and offer a decent amount of electrical capacity. They are also a bit more affordable, for those on a budget. We think the Arlo Ultra home security smart camera system is the best option yet for making your home more secure. Click above to find out more.